We’re playing a board game with Cornish Rock Pools junior when he picks a question card: Name three animals beginning with B. He starts to reel off his answers – ‘Bear, bird…’, then hesitates. His dad makes buzzing noises and flaps his arms, but, like most children, our son wants to come up with his own answer. I’m reminded of the alphabet charts with a picture for each letter, you know the ones. The chart in my childhood classroom had some familiar animals, but also lots of exotic creatures that we were unlikely to see roaming the Cornish lanes (elephant, hippo, zebra, etc). I’m not sure my son has ever seen a real bear of any sort either. No bears here – but there are shark eggs galore! It’s great for children to recognise animals from around the world, but when they’re spending less time than ever out of doors, do they know more about tigers and bears than about the wildlife on their doorsteps? Some kids recognise the birds in the garden and the plants in the hedgerow. Some know where food comes from and how to climb a tree, light a fire and build a den. Many don’t though, and even here in Cornwall the school or Scout rockpooling trip may be the only time some children ever visit a beach. There’s more than one kind of ‘classroom’. Children who feel connected to nature are more likely to look after their environment as adults, and there are benefits for their health, happiness and learning. This makes sense to me when I’m out with groups of schoolchildren. I’ve seen the excitement that makes them forget to act cool and the pride they feel in finding a crab or holding a starfish for the first time. I hope that, for some at least, these memories will last forever. 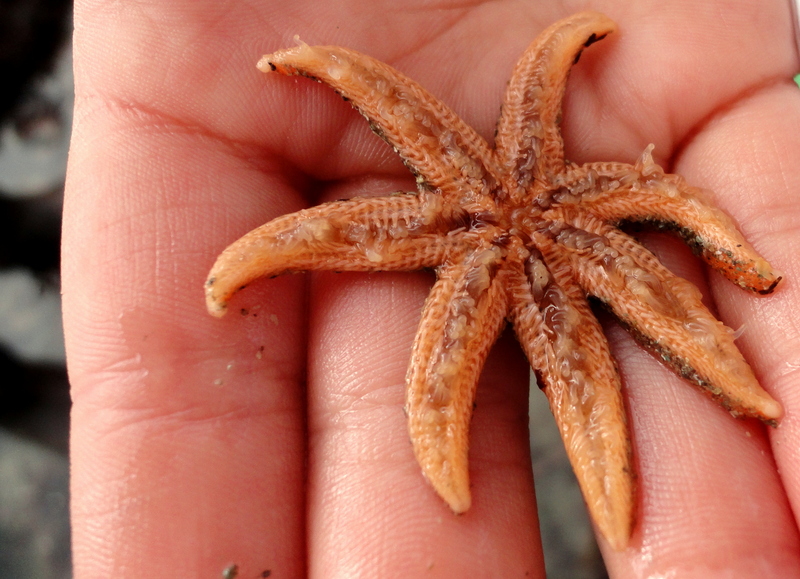 Holding a seven-armed starfish for the first time – looking at the tentacle feet. I sometimes wonder if there can be too much of a good thing. 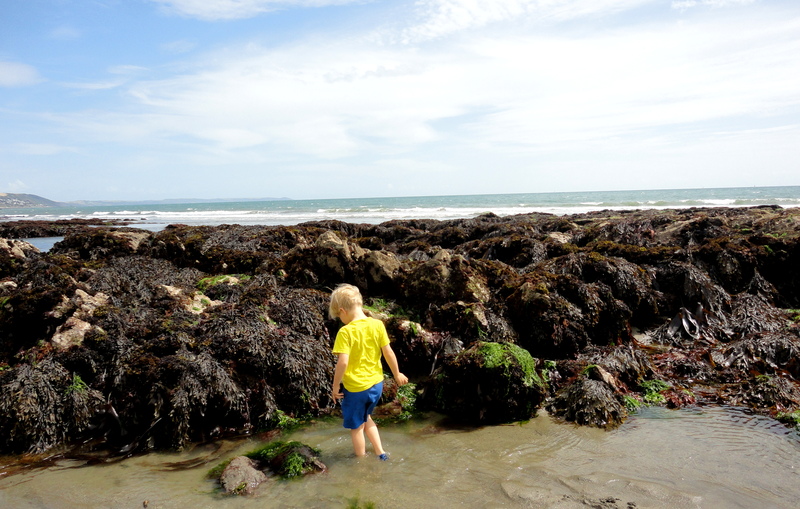 Cornish Rock Pools junior has spent many hours of his young life pacing the shore with a bucket, tramping over cliff tops and staring down microscopes. It sounds idyllic, but he’s also out there in the howling gales and driving rain and has to listen to the same things over and over – during the health and safety chat he now likes to chip in with all the gory things you can do to your bones, limbs and head if you slip on the rocks. I like to think I err on the right side of the child neglect line though. 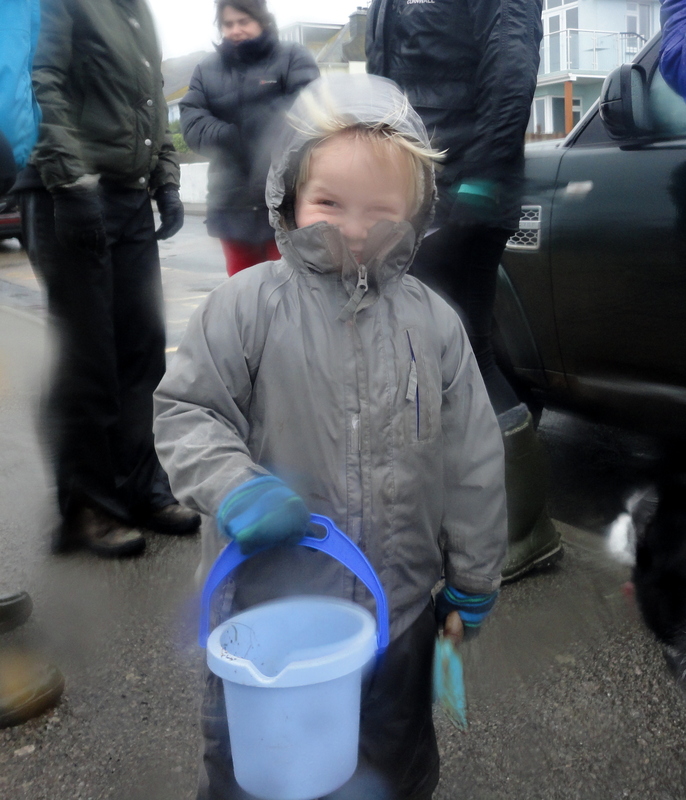 While I’m showing eager young hands how to hold a crab, my son sets out confidently, bucket in hand, intent on his own adventures. 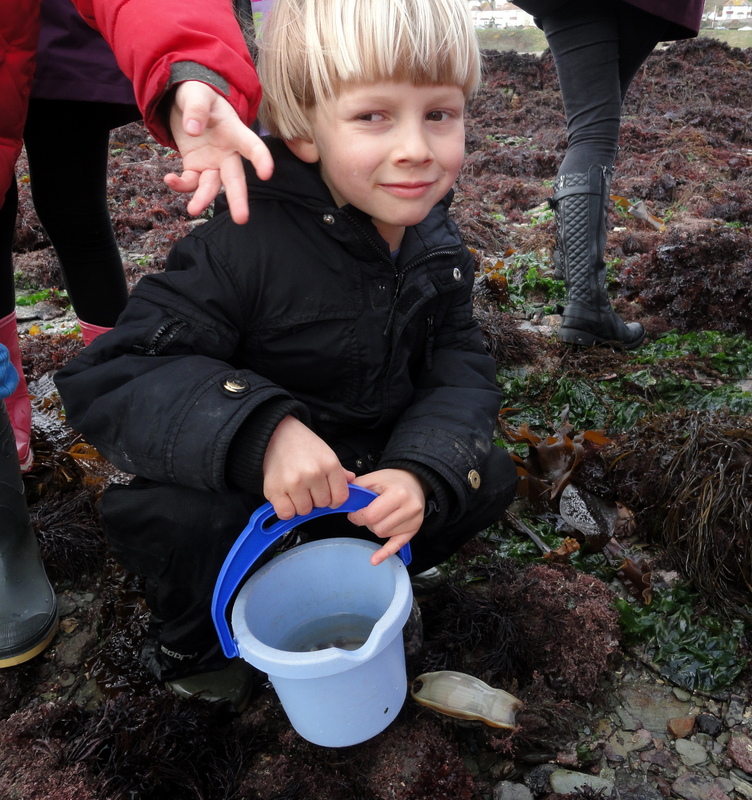 He still brings me his best finds, looks up new things in the guide books and wriggles with joy when we find a monster crab lurking under a rock. And every now and again I realise just how much he’s learning. ‘I’ve got it’, my son shrieks, jumping up and down and waving the question card in the air. 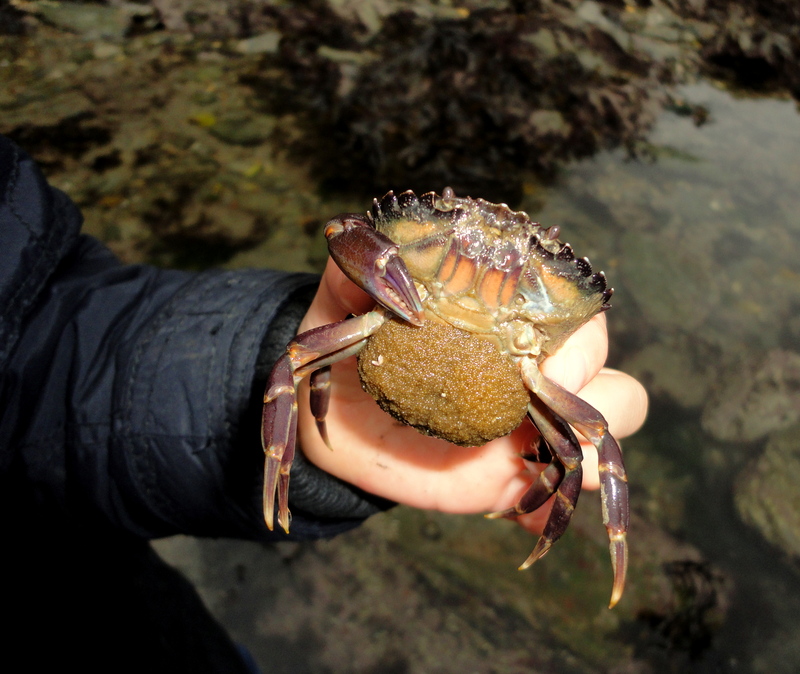 ‘B is for Broad-clawed porcelain crab.’ Of course! That’s my boy. 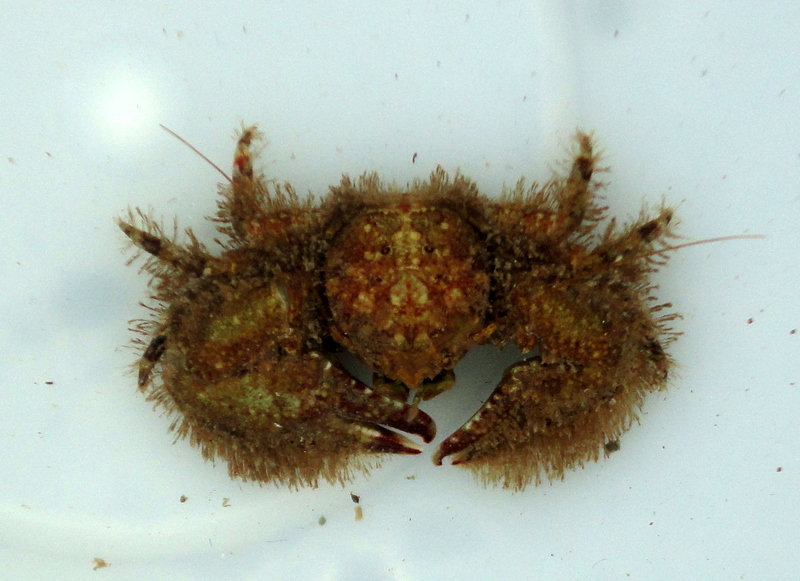 An animal beginning with B: A broad-clawed porcelain crab.